Once you decide to uninstall Parallels on Mac, you might be faced with several unexpected issues. Most believe that just like with other applications, you can easily remove this app from your Mac, but it turns out to be the other way around. The application continues to run on the background or could not be closed. The application cannot be moved to the Trash because it is currently in use. The components of the application cannot be completely removed from your Mac. If you no longer use the application or you simply want to free up disk space, you should take a close look at methods on how to uninstall Parallels on Mac safely. 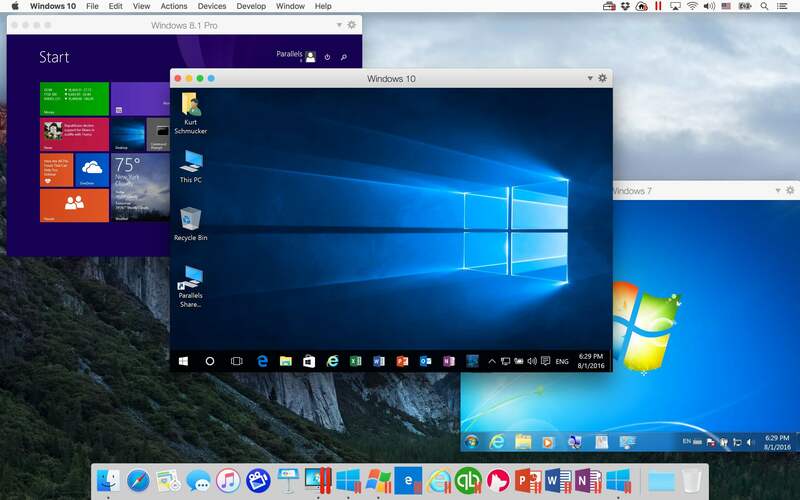 The Parallels Desktop for Mac is simply a desktop virtualization software that enables Microsoft Windows, Linux operating systems as well as applications to operate smoothly on Mac. The software assimilates the guest operating system (OS) into the Mac OS, letting it simulate the native OS operation. The users of this application can choose whether to operate Mac and guest applications side by side on the Mac OS or as a stand-alone guest virtual desktop. As an example, users can open a Windows-based application such as Windows Media Player or Internet Explorer from the Mac Finder utility. In the same manner, you can drag and drop folders, documents and other components from the Windows File Explorer to Finder or the other way around. You can also switch between Windows and Mac OS without rebooting the computer and choose which operating system they want with specific apps to use. Coherence mode. With this mode, it runs guest and Mac apps side by side in a single window. Full Screen. With this mode, it creates a full guest desktop. If this mode is chosen, it allows users to resize and customize the virtual machine windows running on top of the Mac OS. IMyMac PowerMyMac （PowerMyMac, below）is a highly efficient tool that cleans and optimizes your device. If you want to effectively clean out applications and their associated files, you need this tool. It only requires a few clicks to free space on your hard drive, optimize the system and ensure better privacy. Since you want to uninstall Parallels on Mac, this is a hassle-free solution to remove the application from your device. As an all-inclusive and powerful software, PowerMyMac provides Mac users with all the essential tools. The 3 main modules in the app include Status, Cleaner, and ToolKit. Let us focus on your main task which is to uninstall Parallels on Mac. With this task, we will take a close look at the ToolKit module of PowerMyMac which holds a specific tool – Uninstaller. This tool can help you remove Parallels Desktop completely along with its associated files from your device. Open the PowerMyMac application. In the main interface, you will see the general system status of your Mac. 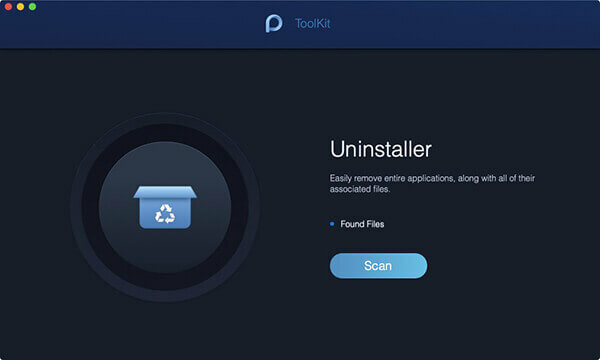 In the ToolKit module, you can find the Uninstaller. Click on the ToolKit icon and select Uninstaller. After opening the Uninstaller interface, click on the “Scan” knob to start the scanning process. You can monitor its progress on the left side of the interface. After scanning, you will see the storage space utilized by the applications installed in your Mac. If necessary, click on “Re-scan” in case you want to double check the information of the target application on your device. Click on the “View” button and proceed to the page of Parallels Desktop. All the apps that are currently installed on your device are listed in the left column. Browse through the list of applications until you find Parallels Desktop or simply key in the name in the search bar. Click on Parallels Desktop and the files or folders under the app will expand on the right screen. Look for folders or files that you want to clean under the Parallels Desktop application. Simply select the option “Select All” to clean up all the files under the app. Double check that all the files that you want to remove are selected. Click on the “Clean” button at the right bottom side to finish this step. Click “Confirm” to uninstall Parallels on Mac and wait for the process to finish. If you are going to uninstall Parallels on Mac manually, there are specific steps that you should carefully follow. Step 1. Close Parallels. Click on the toolbar > click on the Parallels icon > click on “Quit Parallels Desktop”. Another option to close the application is to use the Activity Monitor to ensure that you have closed all the processes associated with Parallels. Step 2. Go to the Applications folder and move Parallels to the Trash. Step 3. Empty the Trash and reboot your device. These steps are officially recommended by the Parallels website. If you are still having doubts if there are any leftover files, you must take a closer look. Generally, applications store their remains in the “hidden Library folder”. When it comes to Parallels, its support files are stored in its personal package. You can find these if you click on “Show Package Contents of the Parallels” before the deletion. Most of the applications on Mac are bundled software that you can easily remove with the manual approach. Nevertheless, some create components such as cache, preference and support files in different system directories during the initial setup and daily use. Step 2. Key in the path of the top level Library on the hard disk “/Library” > hit the Enter key. You should be careful with the items you are going to delete. Remember that deleting the wrong items from the Library can damage or impair other applications or even the system. 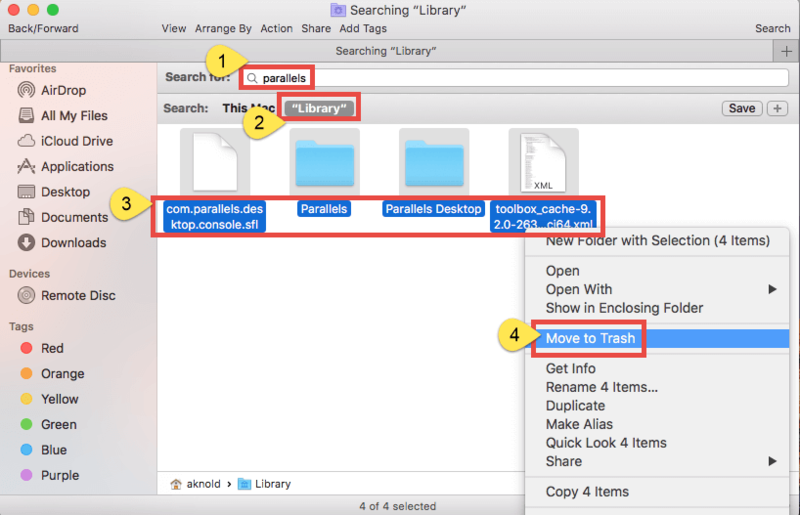 Since it can be time-consuming to go through each folder and search for any leftovers, you can utilize the “Search” in Finder to look for any associated files. Open the user library within the home folder: ~/Library. Enter the targeted application or its vendor in the Search Box > click on the Library. Check for any matched elements > right click and select “Move to Trash” option. In case there are still some files that you cannot identify or locate, simply perform a web search on the application components. For advanced users, the Terminal (found in /Utility folder) can be used to list the contents of the target directory and delete them. Once all the associated items are moved to the Trash, empty the Trash. Remember that this action is irreversible and everything inside the Trash will be deleted. Choose the “Empty Trash” option and click OK in the pop-up dialog. An alternative is to clear out the Trash by choosing the “Empty Trash” in the Finder. If you cannot clear out the Trash, simply reboot your device and try it again. Once your device reboots, you have removed Parallels Desktop from your Mac. iMyMac PowerMyMac is a must-have app that can easily and effortlessly uninstall Parallels on Mac. Whether you want to free space on your Mac or no longer using the application, this removal method is guaranteed to completely uninstall the app along with any of its associated components from your device.